The other day I was reading the Arab Times newspaper and found an article announcing an upcoming show by the famous Ukrainian Virsky Folk Dance performers. Of course, I got very excited and immediately jumped at the chance to attend! 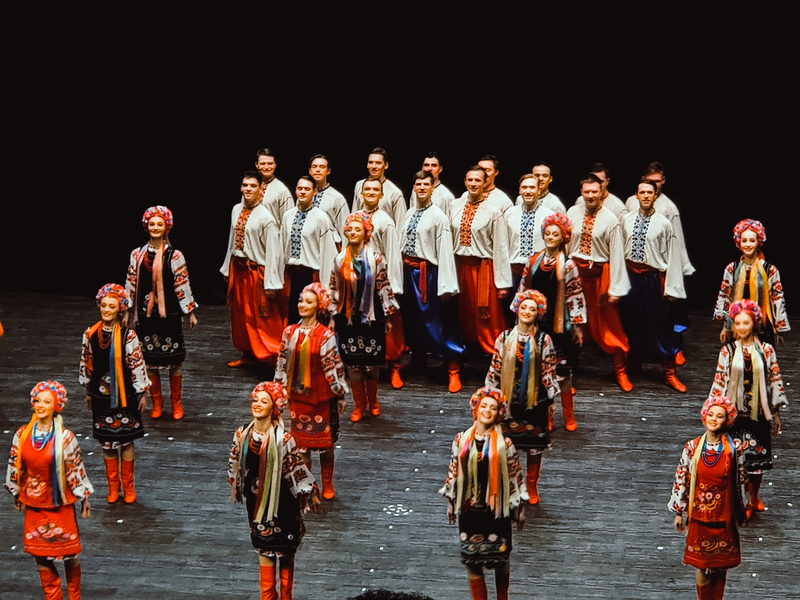 I have always been keen on experiencing the culture of my Ukrainian half, considering that I had never seen a live performance of a National Ukrainian dance and especially one that’s showcased by an ensemble historically famed and celebrated for over 80 years. As part of their 80th anniversary the Virsky ensemble, which were founded in 1937, have set out on a world tour. They were visiting Kuwait for the very first time and I was so happy to be part of the union of two of my cultures – Kuwait as the host and Ukraine as the guest to my home! Prior to that, the ensemble had been a guest to almost 80 different countries and has won several international prizes. The event was held at Abdulhussain Abdulretha Theater and it was already halfway packed once we got there and completely full by the time the show started. It was incredibly beautiful. The handmade embroidered costumes, the perfect choreography of complete harmony, the acrobatic skills, the great virtuosity, the spirit of it all, just everything! It was so lively, passionate, vibrant and moving. I could really feel the soul and history of the Ukrainian culture and it made me so proud. I was at the edge of my seat the entire time! There were a series of different performances that showcased dances from various regions of Ukraine and the traditional diversity was impressive. The high level of artistry and technique was breathtaking, like this performance involving colorful ropes that skillfully intertwine with the dance.